Last week I got an urgent email from Bud Plant, owner of Bud’s Art Books, the place to go for anything in comics, illustration, graphic novels or even ERB. 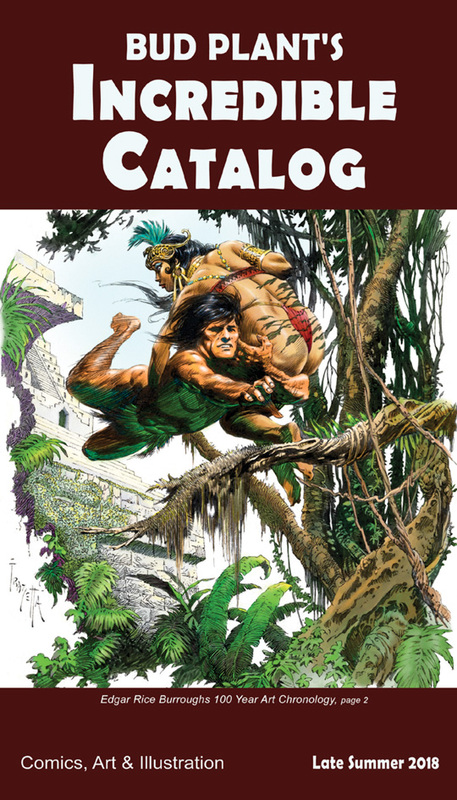 He wanted to use my coloring of the Frank Frazetta art on the Alternate Timeline dust-jacket for TARZAN AND THE CASTAWAYS on the cover of his latest catalog. This to promote Mike Tierney’s new four volume set of EDGAR RICE BURROUGHS 100 YEAR ART CHRONOLOGY. Bud and Mike had been trying to reach me for 10 days to get permission but Mike’s emails weren’t getting through. For some reason, probably SPAM, I had put the mail domain into my Blacklist and all of his emails were going directly to the Trash. Finally, Bud managed to find my Normand Design address among his customer list and contacted me through that. His email was the first I’d heard that he wanted to use the art. Bud had picked my coloring as the best way to promote Mike’s new set of ERB art in pulps, books and comic books. The drawing on CASTAWAYS was a Frazetta piece that he’d liked ever since he’d bought the Canaveral Press book, way back when. He was happy to see it colored at last. Of course I immediately gave my permission and sent over a clean file of the cover art. Then I went back to my email settings and dug through both of my business addresses until I figured out why Mike’s emails had gone missing and fixed that problem. Now the catalog is out and should be in the mail. I’m very proud to have the piece be chosen by Bud. As you can see, they didn’t use the whole book cover, just the Frazetta art, but I still think Recoverings will get some recognition from the customers on his massive mailing list. By the way, if you want a copy of the complete cover for your very own, you should take a look at the Alternate DJs page on the Recoverings site — there are only eleven left and I won’t be reprinting them! Thanks very much Bud and Mike! How can I get TWO late summer catalogs with the Frazetta cover? Well, you might call them up and tell them that yours didn’t get to you. . . are you on their mailing list? Thanks Ms Dubrava! Always a pleasure to hear from you.